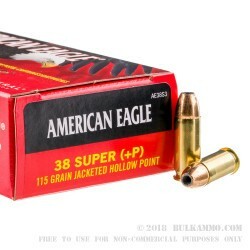 This .38 Super ammo from Federal delivers great performance at an affordable price. 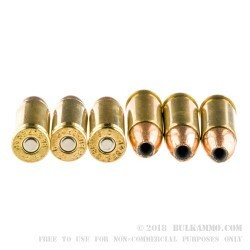 It comes with a light 115 grain jacketed hollow point bullet ideal for defense and range use and boasts a muzzle velocity of 1,130 feet per second, which is relatively slow for a .38 Super but still more powerful than most 9mm loads. With a heavy 1911 in your hands, you'll hardly feel the recoil! These cartridges are manufactured by Federal and sold under the economical American Eagle brand. Like all other .38 Super ammo, they carry the +P mark to distinguish them from the obsolete .38 ACP round. 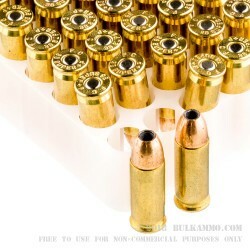 Any .38 Super pistol can fire .38 Super +P rounds. Grab a few boxes from BulkAmmo today!